Located in the Snowdonia National Park in North Wales, Mt. Snowden attracts some half-a-million visitors a year. The area has many associations of the legendary King Arthur and the wizard Merlin - this will be the subject of another post at a later date. 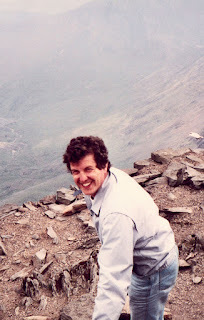 I visited the Mount Snowdon way back in the late 1980s and discovered that there were three ways to reach the summit.. The first, the 'hard way' – the way of the mountaineers,who climb the North Face cliff that is named Clogwyn Du’r Ardue a seriously forbidding rocky crag considered to be high-grade mountaineering in UK mountaineering standards. Not that I know anything at all about mountaineering… that certainly wasn’t the way to get up Snowdon for me! The second way up Mt. 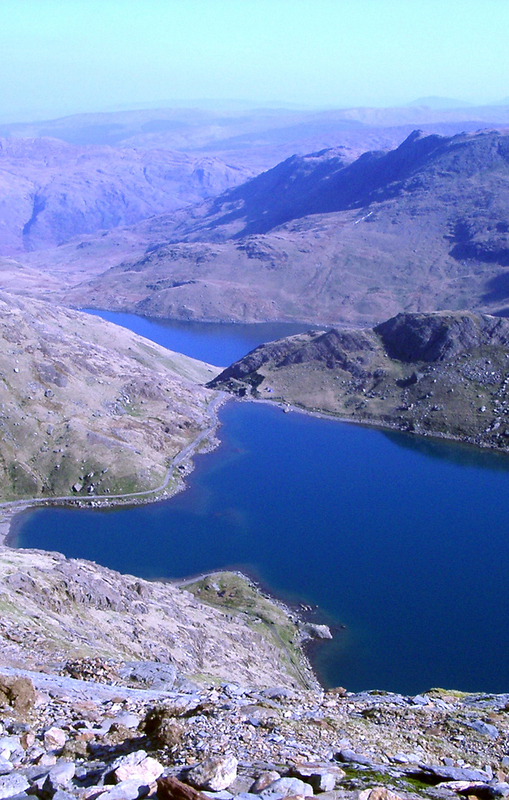 Snowdon was the ‘long way’ - a very challenging way to walk up the slopes for around 5 miles. One would need a lot of stamina (something that I don't have!) and good weather, because it can get to be quite dangerous if bad weather sets in regardless of one's fitness. Weather can change very quickly on the slopes of Snowdon. The easiest way to reach the summit was by a steam train that travels up a steep rack and pinion railway track that was put in place during Victorian times. This track has a toothed rack rail, that is fixed between the running rails which ensures that the train does not start to slip backwards on its outer rails! The weather was good back on the June day back then. But walking up the second (long) way, did not appeal at all, and climbing did even cross my mind, so it was the train for me. Early June being out of the main holiday season in the UK, meant that there was no problem in getting a ticket, so the train-ride it was. Llanberis is a village at the foot of Mt. Snowden. 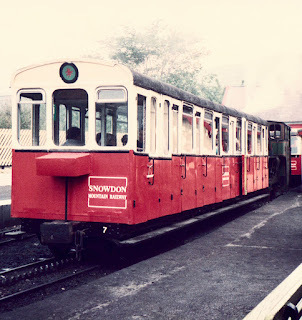 It is from Llanberis Station that we boarded this very train that took us up the steep slopes and along the high ridges to the summit of Mount Snowden, some 3,560ft (1085mtrs) above Sea Level. Finally at the top of the mountain there is a raised large rock platform and here I am waiting for my turn to stand on it and take in the view. From there all I was expecting to see a panorama of the adjacent Snowdonia hills rising up out of valleys and one or two mountain lakes some of which rumoured to have connections with King Arthur and his magician Merlin (more of this in another story). It had been very sunny when we had set off on the train from Llanberis but I was surprised and disappointed that up here at the summit, it was very misty and visibility beyond adjacent hills was not possible. However, I learned from a fellow-visitor who had been before, that standing on the summit one can see over to the coast of Ireland, across England to the Isle of Man and some 144 miles to Southern Scotland in the North. But unfortunately I was not to witness this. 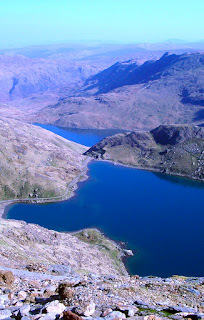 I decided that I would have to come up to North Wales again, and get up Mt. Snowdon, but alas I have not got around to it as yet. with King Arthur and Merlin.